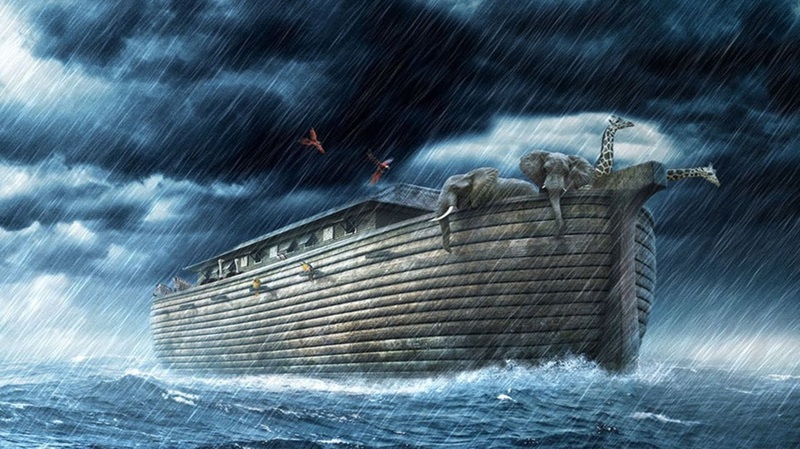 Of all the miracle accounts in the Bible, the story of Noah and the ark he built so a remnant of humans and living creatures could escape cataclysmic events has survived scholarly efforts of disapproval. Not only is the story found in the fifth chapter of the Book of Genesis, a comparable account is told in the Epic of Gilgamesh and flood stories survive in many tribal myths including the American Indians and on the Islands of Hawaii. In spite of scientific evidence that puts the story in question; many fundamental Christian believers still accept the story as the “gospel truth.” Investor Ken Ham not only believes the story, he has erected a $102 million timber-frame replica of what he believes the ark might have looked like in Northern Kentucky. This monster land-locked ship has been built as a tourist attraction. It opened for customers on July 7. Just what happened at that distant time in the past, and why it occurred, remains a mystery. All of the stories say there was a great flood. Yet some have shown through scientific data and mathematics that even with the collapse of a suggested vapor canopy it would have been impossible for enough water to gather over the surface of the Earth to cover all of the land unless the surface of the planet was relatively flat. And from our understanding of volcanism and plate movements, that is highly unlikely. Archaeological and geological discoveries, however, show that something spectacular brought cataclysmic events that caused a mass extinction at least once, if not several times in the history of this planet. There are various places, now raised as high as mountain peaks that show fossil evidence of once being sea beds. The ruins of a once great City of Tiahuanaco, near the boundary of Peru and Bolivia, show that the place was a harbor with well-designed docks capable of accommodating hundreds of vessels. Yet the place today is found on a plateau 4000 meters above sea level. The ruins of other ancient cities have been found in hundreds of feet below sea level, deep in the Mediterranean, Gulf of Mexico and just off the coasts of India and Japan. They give credibility to the myths about splendid civilizations of Atlantis and Lemur that were destroyed by powerful earthquakes before sinking into the sea. Obviously the Earth experienced cataclysmic upheavals of its surface, long after civilizations were established. But when did all of this happen? That the ruins of well-developed cities with docks to accommodate ships are found on a high plateau suggests that an advanced civilization existed a very long time ago. This conflicts with the Biblical time table, setting the flood at about 5,000 to 6,000 years ago. Geological evidence suggests that the dinosaurs went extinct from some kind of cataclysmic event about 65 million years ago. Evidence in the rocks also seems to show that humanoids with enough intellect to hunt and wear foot covering lived at the same time as the dinosaurs. But was it a flood and did it happen that early in human history? And if so, how could there be such a wide variation in time estimates? The plausible theory is that we have developed into great societies and then failed more than once, each time escaping from some kind of disastrous event that brought us to a threat of total extinction. Now as the world once more plunges toward total life extinction we must wonder if there can be another remnant of life left to carry on. In the Biblical story, Noah met extreme social resistance. He was the target of constant barrage of ridicule while building the "ark." The question now is: can we do it again? Of course the ark story is far too simplistic and full of holes to be believable. That one man could single-handedly build a ship large enough to hold two of every kind of animal then in existence on the planet, plus the food and fresh water enough to keep them all alive for the months that the vessel would float on an open sea, was incredible enough. The other problems with the story is that most of the animals are carnivorous, and consequently would feed on the smaller creatures packed with them on the ark. Also the story suggests that Noah and his immediate family then became the origin of the contemporary human race. No matter how we examine the story as recorded in Genesis, it just could not have happened that way. Floods are common events all over the world. Some can be catastrophic in localized areas. Thus the stories that are passed down by tribes around the world obviously refer to localized events. To people who could not easily communicate with other world inhabitants in that early time, a major flood event would cover the world as they knew it.